I have just finished work on a preliminary set of new ways and bridges for rail and road transport (including updates to existing ways and bridges), to take advantage of the maximum height/length feature on bridges that Pak128.Britain does not use, and also to take advantage of the Simutrans-Experimental specific weight limit feature. I have not produced any new graphics for the new bridges/ways, using instead the closest existing graphic that I could find: hopefully, somebody more talented than I can fill in the graphics later. If people start building their transport networks now, and new graphics are added later, they should be compatible with existing saved games without breaking anything. Download the source files here. For Simutrans-Experimental, download the compiled binary here. Unzip BritWays-Ex.pak into your /simutrans/Pak128.Britain-Ex folder, and the en.tab into your /simutrans/Pak128.Britain-Ex/text folder (over-write your existing en.tab). This is the latest set of translation texts for Pak128.Britain-Ex, and it also fixes a number of errors in the previous translation texts. I should be very grateful for any comments on how these new ways and bridges are balanced, particularly, how well that they work with Simutrans-Experimental and the weight limits feature. The idea is to give players a greater variety of ways, but also more constraints, making for far more interesting civil engineering/vehicle choice decisions. This is the first time that weight limits have been deliberately implemented in any pakset, and I am very interested in general feedback as to how well that they work. Ahh, I have already done that, but needed further options in order to give the full range. Different tracks in different eras, with different price/weight/speed restrictions. There will not be all of the tracks available at once. in the real world there are 10 ratings for train tracks in UK, called Route Availability. 1 through 10. 1 allowing only the lightest axle loads and 10 allowing all weights. the heavy RA7~9 rated tracks are for heavy express/freight duty and the lighter ones for branch line duty. 7 tracks spread out through the timeline doesn't seem so bad. ok, 7 tracks seems a bit much to choose from, 6 or 5 I think would be ok, considering there are 3 legacy + 3 current tracks that you can choose from. I played with rail mainly, so all the issues listed are with rail. bridges and roads seemed ok so far. I guess the bridge intro/retire date is work in progress? big gap in medium rail (100t) between 1915-1963, wssri (75t) is too light to be useful, possible fix: Wooden sleeper steel heavy retire date 1915 > 1960, where next 100t medium rail (cssr) becomes available. Too many choices in light rail from 1960-1974, possible fix: Wooden sleeper steel light retire date 1974 > 1963 & Wooden sleeper steel retire date: 1974 > 1963, where cssr light becomes available. Too many choices in heavy rail from 1980-1986, possible fix: Imp. Wooden sleeper steel Hvy. retire date 1986 > 1960, where concrete steel sleeper hvy. becomes available. Imp. Wooden sleeper steel leaves gap when retired, possible fix: Imp. Wooden sleeper steel rail retire date 1986 > 1996 where steel sleeper becomes available. thank you for your feedback - your testing work is most helpful. As to the bridge retirement/introduction dates, I thought that I had finished them - are there anomalies left? As to medium rail between 1915 and 1963, in that earlier era, 75t is meant to be the medium weight railway lines - only later, in the diesel era, do locomotives become heavier such that something at circa 100t becomes medium. Only the heaviest and most powerful locomotives in the era 1915-1963 (with the exception of diesels) cannot use 75t track. The new diesels from the late 1950s onwards (with the exception of multiple units and the class 20) need to use the heavier track until the concrete sleeper track becomes available. One must update one's infrastructure to match the changing times - that is part of the challenge. As to light rail 1913-1925, whilst an overlap in availability of an old and new type of way type is not necessarily a bad thing, I have put the retirement date of wrought iron track back to 1914, as it is unlikely that, in reality, wrought iron track would have been used into the 1920s. As to light rail in the era 1960-1974, there are only two choices: concrete or wooden sleeper. I do not think that two choices is excessive: it is intended to represent a transitional period in railway technology. You will notice that the concrete sleeper track is much more expensive to lay, but slightly cheaper to maintain, and also has a higher top speed , but a lower maximum weight. These represent real and interesting choices for players. 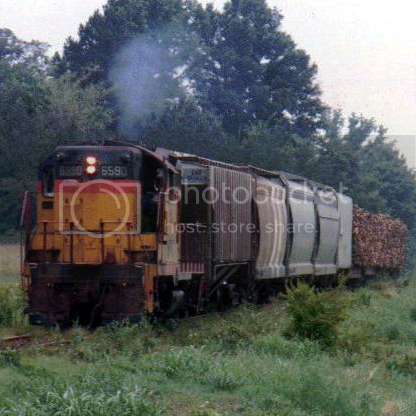 As to heavy rail in the 1980-1986 era, I have moved the retirement date of the improved wooden sleeper steel rail (heavy) back to 1975, as wooden sleeper track would not have been laid for the main lines as late as the 1980s. I think that 1960 is too early, however, as that does not allow for a sufficient transitional period between old and new technologies. As to the gap left by improved wooden sleeper when retired until steel sleeper is introduced, that, again, is intentional. The cost of laying track for all but light use is intended to increase in that era, as it did in real life, as is represented by the diminished availability of less expensive medium weight rail options. As technology improved, so did more cost effective options become available in later times. The differing availability of lower cost medium weight track is intended to be part of the challenge. Thank you again for your most helpful feedback - it is much appreciated. The changes that I have made in consequence of your input will be incorporated into the next release of Pak128.Britain-Ex. Edit: On reflection, I have modified the improved wooden sleeper type track (medium weight) up from 75t to 88t to accommodate a greater range of medium-weight and power locomotives. ok, gotcha, thanks for elaborating your ideas behind the implementation. wssri 88t limit sounds good. it's a bit more even when there are 65t and 150t tracks to choose from in the 1930 era. as for the new bridges, I thought there wasn't a set date, but after looking at the dat files, I do see they are in there. It just seemed like there was a lot to choose from while playing the game. 13 choices in 1930 for example. also, the spanning for 1 tile bridges seems a bit odd. 1 tile can only span a "V" with no room for anything to go underneath it. 2 tile can span a "\_/" with room for one tile width ways to pass underneath it. 2 tile is ok, like passing over a river, but 1 tile bridges seem a bit pointless since it can't span over anything to be useful. If it's ok with the original image creators, I can make some temporary graphics for the concrete bridges and new tracks by changing the colours of existing graphics used in pak128.britain. should make it easier to distinguish for the next release. thank you for your input. The reason for the large number of different bridges is that different sorts of bridges have different purposes: some are for short crossings, some for longer crossings, and some for longer crossings still. There are also different price/maintenance cost options, and, finally, different weight options. Adding a full range of options for each different criterion produces quite a few bridges. Pak128.Britain (and therefore Pak128.Britain-Ex) are open-source, so you (and everyone else) already have permission by default to download and modify the sources, and I should be delighted if you could do so. From my own limited experience of creating Pak128.Britain-Ex content from the standard graphics is that, aside from colour/lightness changes, which can be done from the .png files in the GIMP quite easily, the best way of making changes is to use the original .blend files (which are all set up), make modifications there, and export them. The original .blend files are not found in any repository, but The Hood has always been happy to send copies to me for modification purposes, if he has them himself. As to the one tiled bridge, I spotted the problem that you pointed out a few days ago, and have already modified the .dat files accordingly (to 2 tiles). The modifications will be present in the next release of Pak128.Britain-Ex. Thank you for pointing it out, though. As James says, all pak128.Britain graphics are open source, so if you want to create any modifications feel free, just remember to acknowledge the existing author(s) as necessary. If you're feeling ambitious, you're very welcome to make new graphics (rather than just placeholders with different colours), either from scratch or modifying existing png files or from blender models - just ask me and I can get you the blends. here are the stop gaps for the bridges, distinguished by line speed. rail seems like it would be better to tweak colours in blender. will send pm to The Hood. I was a bit bored in class so I sketched out some bridges and would like to try recreate them in blender as well. If I don't succeed, I guess I can post the sketches up to have other people have a crack at it. small graphical bug with rails that I realized: other than cssr and cssri, on the NS and EW diagonals the overlap clipping shows the rail skewing when there is a trough dug near it. The skewing seems to be caused by the source files having excess material in the NS, SN, EW and WE graphics. It's not present in cssr and cssri. Re the graphical bug - It happens in pak128 too but not pak64. I can't see why digging a trench should make a difference, but as it doesn't happen in pak64 I assume it's graphics related. If you're feeling super-keen you could try downloading the source images and removing excess pixels and see if that solves it (and send me the revised ones if so), as I don't have time to investigate much right now. Just out of curiosity here, are steel sleepers really that common for high speed tracks on your side of the pond? I worked for the railroad, both as part of a track maintenance crew and at the TTCI out West, and steel sleepers have never been applied outside of mining railroads, yard tracks, or other temporary/construction spurs. Maybe it is just the hot climate in my part of the US, but steel tends to expand and lose gauge in the Summer months, which always caused derailments on our yard tracks. Sleepers made from composite materials or the rubber sleepers made out of recycled tires seem to be the best contenders for future high speed corridors here.. Anyway, I was just curious about the steel..
correct, they're just cut and splice from the repository. no problem with me if you include them in the next release. I'll get you the fixed rail images tomorrow. From my understanding, they're quite common on the continent, albeit not so much here. Nonetheless, in more recent times, they have made an appearance. I can't see why digging a trench should make a difference, but as it doesn't happen in pak64 I assume it's graphics related. In fact, such holes make a difference in the painting algorithm of simutrans: if no holes are present then all of the surface (the green) and the ways are drawn from back to front. Then all objects are drawn again from back to front. If there is a hole, this algorithm would fail: any object in the hole would be visible through the ground in front of them, since it would be drawn later. To fix this, any grounds (and ways on it) that would suffer this failure, are drawn as if they would be objects: that is, the green ground in front of the hole is drawn after anything in the hole is drawn. b) in step 2 tiles above the glitches are drawn, thus every pixel drawn in step 1 that is out of its tile is overdrawn here. Thanks for the explanation, I guessed it would be something like this. Far simpler IMO to trim the graphics carefully like in pak64 (no problems there...), which is already 50% done thanks to AEO. removing any bits of track which fall outside of the pink tile. I would do it myself but my evenings and weekends are incredibly full up until after Christmas, and besides, you did a great job with the first bit of corrections you did! sure, I'll take a crack at it. I should probably be able to finish it sometime next weekend. one thing that I've recognized while testing the new ways is, that the weight limit for tracks of 25t in 1830 might be a bit to low. I've started to transport meat via train and with only 9t load, it's not possible to make enough revenue to finace the maintenance cost of the tracks. I used 5 trains to transport the meat with a circle line. I my opinion something between 30 and 40t might be better. AFAIK the weight limit applies to individual vehicles, not the train as a whole. So if I understand you correctly, you could just use a longer train? I tried modifying existing rail images for the various light/hvy tracks available, to hopefully achieve some easier visual recognition. I was thinking, since blueish and whitish tint is used on faster tracks, maybe a yellowish or orange-ish tint for the lighter tracks, bluish for heavier tracks and a reddish or brownish tint for steel sleeper tracks might be good. I think I might have overdone the colour adjustments on some. thank you for that. I think that some of the adjustments, as you suggest, need to be made a little more subtle. Also, some of the "wooden sleeper" tracks look so greyish that they appear to be concrete sleeper types, whereas the steel sleeper types still have the original wooden sleeper appearance. It may be better for us to start with the original .blends used to make these tracks; perhaps The Hood has a copy of them somewhere...? I have the original .blend file, but truth be told, I have a hard time using blender. Can you send me the .blend file? Blender is not too hard to use - have you seen the "from noob to pro" tutorial on the web somewhere? Doing simple things with Blender (and all Simutrans graphics are simple because of the low resolution) is really quite easy. The time-consuming part is exporting. The hood has the original file uploaded to a site somewhere. I'm sure this one is it. images were made by keirongreen and he holds the copyrights to them. As an update to this topic, although I have not had the chance to investigate this fully yet, one thing that occurs to me is that lightness, rather than colour, could be used to distinguish different weight limits of track. Could I make a few balance suggestion? I would lower the speed of the steel sleeper normal rail to from 175km/h to 145km/h and lower the maintenance cost from 120 to 105. This change would give something that's slightly more in the middle between the light tracks and concrete tracks from the late 90's. This should give more incentive to use steel sleeper normal for urban lines, as there are many EMU and DMU trains that have a top speed of 145km/h or less, actually quite a few 120km/h multiple unit trains. I think it would be useful to have another track from about 1930 to 1960 that has a top speed of 160km/h, max weight of 105t. If it was added, it would be between IWSSR normal and IWSSR heavy. There are many locomotives in that era where IWSSR normal is inadequate, but where IWSSR heavy is not needed and that made me wish I had another track to choose from. It would fill in the gap left by WSSR heavy (98t, 145km/h) and CSSR (105t, 200km/h). I think that my reply to your message here, and your reply to it, was lost in the recent server outage - I asked you whether you thought that the scheme that you proposed would reflect real-life practice? If I recall correctly, I think I said that steel sleepers were good for heavy weight, cheap to build and last a long time, keeping maintenance low, but are probably only good for about 120km/h to 130km/h. They are favoured by NA railways, which is anything, but fast. concrete and wooden sleepers have an advantage in speed allowed, but cost more and don't last as long. That's interesting - is there an online source for that information? I ask because the information that I have seen about steel sleepers relates to their use on the Settle & Carlisle line in which they are used only on the Northbound lines because there is a heavy coal freight flow Southbound, so the trains heading South (using concrete sleeper tracks) are heavier, and the trains heading North (using steel sleeper track) are lighter. That suggests that they can take only a limited weight - is your information different? Steel sleepers are used on the Stirling Alloa railway which takes fully laden coal trains, and also on the Airdrie-Bathgate line along which EMUs will run at up to 145km/h. Both are recent construction projects in Scotland. speed allowed, would seem, is entirely on the quality of the steel sleeper, but I would guess that the 60mph sleeper is the most commonly used in north america and manufacturer claims are... well a number derived between engineers, marketeers and lawyers. NA passenger rail is anything but fast and usually never hit more than 70mph, because the freight trains also run along the same lines. there's also this australian railfan site http://www.railpage.com.au/ that mentioned the use of mixing sleepers as a cost saving measure.